It is essential to clean and disinfect contaminated wells following pollution caused by human activities or by a natural disaster (hurricane, flooding, earth tremor, tsunami, etc.) so that they can produce good water quality once again. 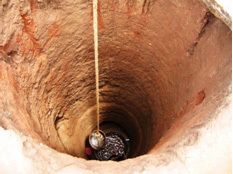 A well or borehole can be contaminated by poor construction, lack of servicing or repairs to the engineered structure, a natural disaster (flooding, earth tremor, tsunami) or environmental pollution. It is therefore necessary to clean and disinfect the well before it can return to service. 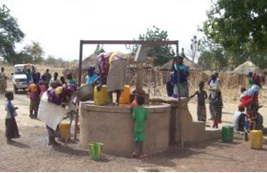 All types of wells and boreholes are affected, especially dug wells in isolated rural areas. Boreholes are better protected as they open less on the surface which restricts the risk of contamination. Various stages must be adhered to for an effective, long-lasting intervention. A well must be cleaned before it is disinfected to eliminate the source of contamination and carry out essential repairs. Once the well has been cleaned and rehabilitated, its inside water level must be allowed to return to its normal level and the turbidity and pH must be measured to ensure that the chlorination has been effective. If the water is cloudy, no more chlorine should be added to the water as the suspended particles protect the micro-organisms and therefore reduce the effect of chlorination. The turbidity is measured in NTU (Nephelometric Turbidity Unit). If the turbidity of the well water is more than 5 NTU after cleaning and rehabilitation work, the well must be emptied of water one more time and the internal well liner must be cleaned with a fairly strong solution of bleach. Let the well fill once again and re-check the turbidity to make sure that it is normal. 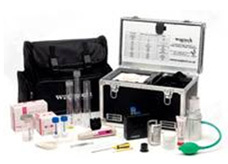 For more detailed information, see sheet E27 "Methods and available means, either simple or more elaborate, for the physical, chemical and/or bacteriological analysis of the water." - Take a large clean bucket or bin, with a fairly dark inside colour and at least 50 cm deep. - Drop in a coin or 2 or 3 cm, pour in the water to be analysed and stir. - Leave it to settle. - Is the coin visible ? If yes, this means that the NTU is less than 10. If not, measure the approximate height of the water that is transparent. - If this is less than 32 cm, the NTU is probably greater than 20. Filter the water and measure again. - If this is between 32 and 50 cm, the NTU is probably between 10 et 20. It is advisable to filter the water. WHO stipulates full disinfection of the water as soon as there is a risk of pollution and in emergency situations. There are a variety of ways of doing this, but the most common is chlorination which has the advantage of leaving a residual disinfectant in the water after the disinfection treatment. Chlorine also has the advantage of being widely available, simple to dose and use and dissolves easily in water. Conversely, it is a hazardous product that has to be stored and handled with care. Small doses have no effect on pathogenic organisms such as cysts and viruses which required strong concentrations of chlorine. The chlorine product most used is calcium hypochlorite (HTH or high test hypochlorite) in powder or granule form, with a concentration of 50 to 70% of chlorine for emergencies. Powdered or liquid sodium hypochlorite can also be used. The amount of chlorine required depends on the volume of water in the well. One litre of chlorinated solution at 0.2% per 100 litres of well water must be incorporated. The well water must be mixed carefully with the chlorinated solution and settle for at least half an hour. The volume of chlorinated solution must be calculated from the design parameters of the well according to the method shown in the insert below. For each m3 of water in the well, add 10 litres of chlorinated solution. 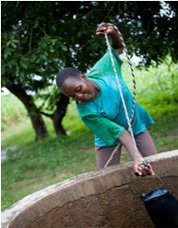 After the period in contact with the chlorinated solution, it is important to empty the well with a pump or bucket and leave the well to refill. When the well is full once more, wait about half an hour and measure the residual chlorine concentration. The well can be used if this concentration is less than 0.5 mg/l. Otherwise, the well must be emptied of water again and the operation restarted. It is absolutely essential to ban the use of the well during the cleaning/disinfecting phase, as the water is very highly chlorinated which tastes nasty with a strong smell and could be dangerous to use. It is normally cheaper to disinfect and return a well to service than to build a new well. However, if the well has been severely damaged, a return to service can prove complex and costly. In this case the damaged well should be abandoned and a new one built. The cost of returning a well to service can vary according to the type of well and the damage to it. It is therefore difficult to give an accurate estimation. Bored wells are protected better due to the smaller opening on the surface which limits the risk of contamination. They can however be contaminated by leaks in neighbouring septic tanks, drains or damaged industrial facilities causing infiltrations into the ground. Overall, the same general method is used to return them to service as for the dug wells. 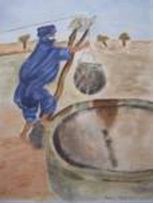 The only specific feature : the inside of the bored well (removal of sludge or waste) can be cleaned by injected pressurised water using a hose inserted in the well. The sludge and the waste suspended in the injected water are evacuated to the surface as the bored well fills up. Pressurised water continues to be injected until the water evacuated to the surface runs clear. A series of very interesting illustrated sheets on emergencies (in English only) have been produced by WHO and WEDC (Water, Engineering and Development Centre) located at the University of Loughborough in Great Britain. - WHO/WEDC : "Cleaning and disinfecting wells"
- WHO/WEDC : "Cleaning and disinfecting boreholes"
- WEDC : "Cleaning and disinfecting boreholes"